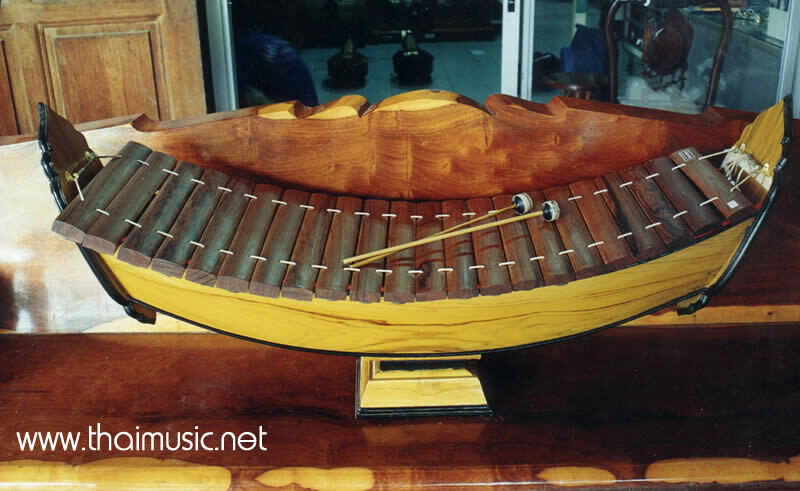 The ranat is a kind of percussion instrument which evolved from the grap. Originally a pair of grap where used to keep the rhythm. Later, several grap were made and put in a series, but the tones where the bars were struck, were coarse and out of tune. Then it was decided to lay them on two tracks or supports. After musicians and instrument makers gained more knowledge and experience, further improvements were made. The grap were constructed in a series of sizes, and a support was devised to hold them in such a way as to allow the tone to sound freely. To accomplish this , a heavy string was threaded through holes made the ends of the grap. The grap were then placed close together on the cord, and the entire"keyboard" was hung on a supporting stand. The keys were struck with two , long slender beaters which had knobs at the ends. One beater was held in each hand. The instrument could now be used to play melodies.